Abstract: The hierarchical classification of life has been claimed as compelling evidence for universal common ancestry. However, research has uncovered much data which is not congruent with the hierarchical pattern. Nevertheless, biological data resembles a nested hierarchy sufficiently well to require an explanation. While many defenders of intelligent design dispute common descent, no alternative account of the approximate nested hierarchy pattern has been widely adopted. We present the dependency graph hypothesis as an alternative explanation, based on the technique used by software developers to reuse code among different software projects. This hypothesis postulates that different biological species share modules related by a dependency graph. We evaluate several predictions made by this model about both biological and synthetic data, finding them to be fulfilled. (open access) More. Watch for Ewert’s work at Mind Matters Today as well, in links from here. 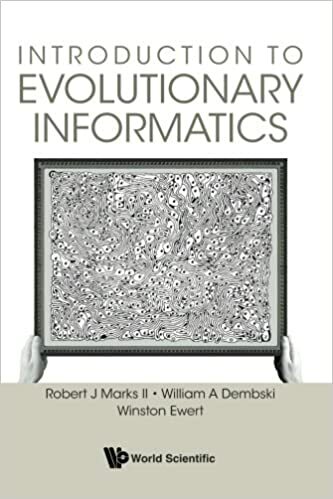 Who thinks Introduction to Evolutionary Informatics should be on your summer reading list? Congrats to Ewert and Bio-Complexity on this new research concept and paper. And to JohnnyB as Editor. For being bold enough to think outside of Darwin’s box 🙂 And thanks to all at Discovery Institute for all the work they do. So glad to see this approach taking form. I know it’s just at the beginning of hashing out concepts, ideas and more details. I think this is the correct approach for reverse-engineering the Code(s) of Life. Looking forward to reading through it. For example, see “echolocation” and “marine” in Figure 3. All marine species depend on a marine module, and the echolocating species depend on the echolocation module. The dependency graph is essentially a tree with extra flexibility; the modules can explain genes shared between species thought to be only distantly related by common descent. A module is not restricted to reusing code from a single source, but can freely reuse from multiple sources. Compare this to common descent where each species must almost exclusively draw from a single source: its ancestral species. If the true explanation for life’s pattern of reuse is the dependency graph, why has it been interpreted as a nested hierarchy? According to the dependency graph hypothesis, the tree is simply a subset of the true dependency graph. Attempts to determine the correct tree of life have simply been uncovering the tree which best approximates the entire dependency graph. This works because some modules contribute much more similarity to species which depend on them than others. Life resembles a nested hierarchy because a nested hierarchical structure is similar enough to a dependency graph structure to approximate it. However, while the nested hierarchy structure resembles a dependency graph it is not exactly the same. The dependency graph hypothesis does not simply predict the same pattern as common descent, nor common descent with unspecified deviations from the general pattern. Instead, it predicts instances of module reuse across taxonomic boundaries. Examples include the molecular convergence found in echolocating mammals  or marine mammals [27, 28]. Others have argued that mammals in general show a similar level of convergence [29, 30]. Moreover, virtually all sequenced genomes contain genes which have been interpreted as having arrived by horizontal gene transfer due to not fitting the hierarchical pattern [8, 11, 12, 31]. If the dependency graph hypothesis is correct, we should expect to find numerous examples of modules that appear to have been reused across taxonomic boundaries. The dependency graph hypothesis draws on the idea of common design, by having reusable modules, as well as functional requirements, by restricting the reuse of modules via the dependency graph. The concept of a dependency graph draws not from an ad-hoc attempt to explain the data, but the actual process used to develop software. It is based on behaviors and practices that intelligent agents are known to use, not simply processes necessary to explain the data. This can’t possibly be an ID paper. I smell a hoax. Nevertheless, biological data resembles a nested hierarchy sufficiently well to require an explanation. While many defenders of intelligent design dispute common descent, no alternative account of the approximate nested hierarchy pattern has been widely adopted. 1- I doubt that Winston understands what a nested hierarchy entails. Evolutionists don’t. Essentially nothing has changed? Still no closer to an unguided, blind explanation than when Darwin lived? They include an interesting history of COI Barcoding and Skeptic’s viewpoints at beginning of the paper. 1) the small fraction of the genome (about 5% of the mitochondrial genome and less than one millionth of the total organism’s genome) might not be sensitive or representative [9, 10]; 2) since animal mitochondria are inherited maternally the apparent pattern of speciation from mitochondria is vulnerable to distortion when females and males roam differently ; 3) the mitochondrial chromosome is subject to types of selection not WHY SHOULD MITOCHONDRIA DEFINE SPECIES? 3 experienced by the nuclear genome : replicon competition within each organelle , among organelles inside each cell [14-16], including differential segregation of organelles at cell division ; and 4) mitochondria in some groups are sensitive to agents such as Wolbachia that are not known to affect nuclear genes . Mitochondrial pseudogenes in the nucleus sometimes confused analysis . Anecdotally, some domain experts felt that only specialists can reliably recognize species in each group and that “DNA taxonomy” was felt as necessarily inferior or a threat. specialists do not agree reflect geographic splits within species or hybridization between species. Others upon further investigation been attributed to mislabeling or sequence error . cases COI barcodes yield a close approximation of what specialists come up with after a lot of study. Birds are one of the best characterized of all animal groups and COI barcode clusters have been tabulated as agreeing with expert taxonomy for 94% of species . I guess a good question is how might this research of COI Barcode information findings confirm or enhance Ewert’s approach of Dependency Graphs vs that of the long-held consensus TOL? And another intriguing question is, does this study by Thaler and Stoeckle align with Gould’s Punctuated Equilibrium? If so, then does the hypothesis by Ewert align as better heuristic for research than blind, random, Darwinian gradualism? Common Descent or Design? Which model best explains the genetic data? Excerpt: Ewert’s three types of data are: (i) sample computer software, (ii) simulated species data generated from evolutionary/common descent computer algorithms, and (iii) actual, real species data. Ewert’s three models are: (i) a null model which entails no relationships between any species, (ii) an evolutionary/common descent model, and (iii) a dependency graph model. Second, for the simulated species data generated with a common descent algorithm, it is not surprising that the common descent model was far superior to the dependency graph. That would be true by definition, and serves to validate Ewert’s approach. Common descent is the best model for the data generated by a common descent process. Third, for the actual, real species data, the dependency graph model is astronomically superior compared to the common descent model. Let me repeat that in case the point did not sink in. Where it counted, common descent failed compared to the dependency graph model. The other data types served as useful checks, but for the data that mattered — the actual, real, biological species data — the results were unambiguous. Ewert amassed a total of nine massive genetic databases. In every single one, without exception, the dependency graph model surpassed common descent. Darwin could never have even dreamt of a test on such a massive scale. Darwin also could never have dreamt of the sheer magnitude of the failure of his theory. Because you see, Ewert’s results do not reveal two competitive models with one model edging out the other. We are not talking about a few decimal points difference. For one of the data sets (HomoloGene), the dependency graph model was superior to common descent by a factor of 10,064. The comparison of the two models yielded a preference for the dependency graph model of greater than ten thousand. Ten thousand is a big number. But it gets worse, much worse. Ewert used Bayesian model selection which compares the probability of the data set given the hypothetical models. In other words, given the model (dependency graph or common descent), what is the probability of this particular data set? Bayesian model selection compares the two models by dividing these two conditional probabilities. The so-called Bayes factor is the quotient yielded by this division. The problem is that the common descent model is so incredibly inferior to the dependency graph model that the Bayes factor cannot be typed out. In other words, the probability of the data set, given the dependency graph model, is so much greater than the probability of the data set given the common descent model, that we cannot type the quotient of their division. Instead, Ewert reports the logarithm of the number. Remember logarithms? Remember how 2 really means 100, 3 means 1,000, and so forth? Unbelievably, the 10,064 value is the logarithm (base value of 2) of the quotient! In other words, the probability of the data on the dependency graph model is so much greater than that given the common descent model, we need logarithms even to type it out. If you tried to type out the plain number, you would have to type a 1 followed by more than 3,000 zeros. That’s the ratio of how probable the data are on these two models! By using a base value of 2 in the logarithm we express the Bayes factor in bits. So the conditional probability for the dependency graph model has a 10,064 advantage over that of common descent. 10,064 bits is far, far from the range in which one might actually consider the lesser model. See, for example, the Bayes factor Wikipedia page, which explains that a Bayes factor of 3.3 bits provides “substantial” evidence for a model, 5.0 bits provides “strong” evidence, and 6.6 bits provides “decisive” evidence. This is ridiculous. 6.6 bits is considered to provide “decisive” evidence, and when the dependency graph model case is compared to comment descent case, we get 10,064 bits. The problem with all of this is that the Bayes factor of 10,064 bits for the HomoloGene data set is the very best case for common descent. For the other eight data sets, the Bayes factors range from 40,967 to 515,450. In other words, while 6.6 bits would be considered to provide “decisive” evidence for the dependency graph model, the actual, real, biological data provide Bayes factors of 10,064 on up to 515,450. We have known for a long time that common descent has failed hard. In Ewert’s new paper, we now have detailed, quantitative results demonstrating this. And Ewert provides a new model, with a far superior fit to the data. Darwin never said that descent with modification predicts any tree or nested hierarchy. What sort of graph would descent with modification create? Unless you have species materializing out of nothing and converging into a single species, you have a tree. Perhaps a tree with a couple roots if life started in a couple different places. The core of evolution, whether Darwinian or theistic, is common descent with modification. Common descent necessitates a tree model. Dr. Ewert has decisively refuted the tree model. Therefore, evolution of every flavor is kaput. You are welcome to join the conversation. Peace. Thanks for setting up a dialogue, but it would help if you didn’t then close it! The discussion started by sygarte on Table 4 contains several mis-understandings of what Bayes Factors are. FWIW, when I saw Table 4 my reaction was that the values are barely plausible: some are several orders of magnitude larger than any other (log-)Bayes Factor I’ve seen. I do not care for your approach towards Winston as someone who is dishonest and needs to gain your trust. What sort of graph would descent with modification create? Perhaps an undirected dependency graph. But let’s be honest. The Darwinian model is that of a tree. If that has changed it would sure be nice to know when and why. Perhaps the evidence didn’t fit the model and scientists are having to face the facts. Mung @ 13 – No, the graph is directed (as time only goes in one direction). But it’s bifurcating, i.e. each node (except the root) has one edge going to it, and 2 leaving it. @Mung, yes I agree. While the tone is much more cordial than the skeptic zone, it is also condescending. Dr. Ewert’s paper is well argued and he added many qualifications to minimize his claims. He has the necessary credentials and expertise for the methods he used. So, Dr. Ewert’s paper should be received as one would receive any other serious researcher. Not as if Dr. Swamidass is the gatekeeper to the scientific world, and he is allowing Dr. Ewert into the fold. The Darwinian model is that of a tree. If you want to get technical then divergence would expect patterns as diverse as every population would represent a bifurcating node to a chain of being. Just think how messy the diagram of every population depicted that way- as a bifurcating node. As a reference in the diagram in the OP the lines of descent contain thousands to millions of populations that need to be made into a bifurcating nodes. Messy. Very. Quickly. So evos simplify to try to fool the masses and unfortunately it has worked. Bob O’H to keep the main thread focused on Winston Ewert, we closed it when he left. That is out of respect for him, and we hope he will come back as he advances his effort. There is a side discussion where we can hash our your point about @sygarte. You might be right. Join us there and explain? Also, there is unfortunate confusion about evolution here. Common descent does not predict that data will fall perfectly in nested clades. Common descent does not produce DNA that falls into a tree. This is well known by experts, but “popularizers” have been wrong. So Ewert’s might be understood to dispatch a cartoon version of evolution. This has nothing to do with evolution as understood in mainstream science. The Darwinian model is that of a tree. This ought to be without any question. Why pretend otherwise? See the Wikipedia article and the see the drawing by Darwin himself. Now they want to pretend like the Darwinian model is NOT a tree? Please. Ewert might be right, but why do many ID proponents always complicate matters? 1. “Nested hierarchies” or “cladistic analysis” or “consilience of independent phylogenies” is often offered as support for Darwinist evolution. This is the idea that the “tree of life” classification of organisms is somehow objective despite being a creation of very zealous “evolution” advocates. The three basic assumptions of cladistics models are: a) Any group of organisms are related by descent from a common ancestor (UCD – universal common descent); b) There is a bifurcating pattern of cladogenesis; c) Change in characteristics occurs in lineages over time. Although not explicit, UCD (“descent from a common ancestor”) here means by a Darwinian “natural selection mechanism” and not by a process generated by a designer that also happens to make use of biologic reproduction. 2. No assumption can be tested by the model that uses them. That is why they’re called ‘assumptions’ and not ‘conclusions’. Instead, assumptions have to be tested independently through an entirely separated method or be accepted as axioms. An UCD “mechanism” has never been observed or proved elsewhere and is not “self-evidently true”, therefore not a valid axiom. Because UCD is an assumption in “cladistic analysis”, it cannot be logically also a conclusion of any such analysis. Furthermore the conclusions of any “cladistic analysis” will always and trivially be compatible with the UCD assumption in that model. 3. Hypothesis testing requires an alternative (null) hypothesis and a procedure that demonstrates how the data available is compatible with the successful hypothesis and at the same time is statistically incompatible with the alternative hypothesis. In the “cladistic analysis” case, the alternative hypothesis to UCD is “common design”, and of course UCD cannot be an assumption of such an analysis. However this rule is violated twice, first by the use of an assumption also presented as conclusion, and second by the prejudiced rejection of the alternative “common design” hypothesis before analysis. This clearly demonstrates that “cladistic analysis” can never be logically used as proof of UCD. What “cladistic analysis” is instead is ‘curve fitting’ where the cladistics model is best fitted to certain (conveniently selected!) morphologic/biochemical/genetic biologic data points. 4. The ‘designer’ hypothesis cannot fail against the ‘no designer’ (Darwinist evolution) alternative in a biologic comparative analysis as designers have maximum flexibility. This is not surprising as designers are free to incorporate whatever mechanism they want, including intelligent “selection” (human breeders do!) and “common descent” (human breeders do!) if they so desire. 5. The claim that cars and other entities cannot be uniquely and objectively classified (“nested hierarchy”), while organisms can, is false. On one hand, we do know the history of the automobile, so a proper classification must be able to reconstruct their unique “evolution”. Yes, vehicle share parts, so to get to the actual development tree, we must group them differently than organisms since mass production works differently than biologic reproduction. On the other hand, organisms may not be uniquely classified as demonstrated by the numerous revisions and exceptions to the “tree of life”, and in any case, “uniquely classified” is an absolute claim that can never be proven since it is impossible to compare the infinity of possible organism classifications. 6. The claim that the “tree of life” based on anatomy is validated by the match with the tree based on biochemistry fails. Anatomy is not independent of biochemistry. Also, the oldest DNA ever found was 700k years old therefore any match between the independent trees is limited. This is not to say that the fossil record is complete, or that fossils can be positively linked to one another and the living without – once again – presupposing UCD. The claim that “there is no known biological reason, besides common descent, to suppose that similar morphologies must have similar biochemistry” is false as the ‘designer’ hypothesis produces the same result when one designer creates all morphologies, and furthermore “I cannot think of an alternative reason why…” is not a valid argument. Sorry, I mean an undirected graph model. Good to see your new blog, but are you no longer affiliated with Biologos? If so, why? I am looking forward to debating you as you were one of the few bright minds at Biologos. Let the honest scientists outside ID take a look and assess. First they will need to establish that they are telling the truth in order to gain our trust. @Cornelius_Hunter, with all due respect, this is @Winston_Ewert’s thread. We are not interested in your arguments on his behalf here. He can make his own case. Yet everyone and their briother is invited to point out what’s wrong with Ewert’s paper. No is allowed to defend it except Winston. Sounds more like Peaceful Bias than Peaceful Science. And hardly the Christian response. If 1 is true, then claiming common descent is fitting the data to our model, as nonlin points out. 2 might be true, but not mentioned in any account of evolution I’ve heard of. Plus, it wouldn’t fit the dependency graph model all that great. 3 is much more supported by creationism. A final possibility is horizontal gene transfer, but if it is so much that a dependency graph results, then common descent is not really happening here. Hello all. Pleasure to see some regular faces around here again. Just answering a few quick questions, and I’m not likely to be back after that. 1. Yes, I did separate from BioLogos. If you google my name and BioLogos, look at my blog/forum, and look at ENV, you’ll see the whole story laid out largely correctly. 2. I’m happy to answer any questions at the peaceful science forum, including those about evolution and the nature of Peaceful Science. https://discourse.peacefulscience.org/ Everyone is welcome, including ID advocates and opponents of evolution. We will treat you fairly. 4. As I’ve said before, comments related to Ewerts you can make here: https://discourse.peacefulscience.org/t/side-comments-on-the-dependency-graph-of-life/743/12, or jump into any thread you like there. See you soon. Until we meet again, thanks for being kind hosts. I am not planning to return to this thread, so please send questions to the forum. Peace. And the Ptolemaic model has the Earth as the center of the universe. Both the Ptolemaic and Darwin models have been superseded and replaced by models using modern knowledge based on ancient ideas. Swamidass states that biological information “does not require a communication system”. Such statements serve his bureaucratic purposes, but there isn’t a chance in hell he can defend such a thing. The key to his success is that he’ll never have to. He’ll make certain of that. 3. Regarding Cornelius, I gave him his own thread because he was hurting Ewert’s case. Did you give a thread to each of the critics who were also hurting Winston’s case? No? One of the complaints in the thread about Winston’s paper over at Peaceful Science is that he does not use DNA sequences. Instead, he uses gene families. And I may need to understand the paper better, but for one of his controls Winston used an evolution simulator which of course uses common descent, and just guess which model fit it best. Hint: Not the dependency graph. Joshua also thinks that there is strong evidence for Common Descent. That is strange because both chimp and human genomes have been sequenced and no one is close to linking the genetic differences to the anatomical and physiological differences. I blame it on the pop sci authors. no one is close to linking the genetic differences to the anatomical and physiological differences. And those are the lest significant differences. Human consciousness, rationality, communication/language, innovation … there is a very large gap between chimp and human. Excellent rebuttal to Swamidass’s snob-foolery. No, there’s no confusion here. He merely pointed to usual position of Darwinist or like your friend Venema at BioLogos. Evolution predicts that living things will be related to one another in what scientists refer to as nested hierarchies — rather like nested boxes. Groups of related organisms share suites of similar characteristics and the number of shared traits increases with relatedness. This is indeed what we observe in the living world and in the fossil record and these relationships can be illustrated as shown below. Many posters and commenter’s here know the revolutionary times and changes taking place over the last several decades in Darwin’s Evolutionism and by Darwinist supporters. It’s not news to us what is happening in the field. DATGC- Both of your sources make the common mistake made by those who don’t understand nested hierarchies. They think that because a nested hierarchy, like Linnaean Classification, can be depicted as a branching tree then all branching trees can placed into a nested hierarchy. That isn’t so. Also they lose sight of the fact that with nested hierarchies each level consists of and contains the lower levels. With the UCB site each level is an alleged ancestral populations. These do not consist or nor contain their descendent populations. Nested and non-nested hierarchies:ted hierarchies involve levels which consist of, and contain, lower levels. Non-nested hierarchies are more general in that the requirement of containment of lower levels is relaxed. For example, an army consists of a collection of soldiers and is made up of them. Thus an army is a nested hierarchy. On the other hand, the general at the top of a military command does not consist of his soldiers and so the military command is a non-nested hierarchy with regard to the soldiers in the army. Pecking orders and a food chains are also non-nested hierarchies. Well, we know our theory is true so what we need is not more accurate stories but more effective propaganda. It doesn’t matter if the more effective propaganda is inaccurate, because we know our theory is true anyway. What Common Descent requires is a mechanism capable of explaining the anatomical and physiological differences observed between two allegedly related species such as chimps and humans. Right now we don’t have that. So right now the best we can do is say “we don’t know”. That is the only honest scientific answer to the question. He, a real scientist, will explain how/ why that is false later. Does anyone disagree with the first sentence? What Common Descent requires is a mechanism capable of explaining the anatomical and physiological differences observed between two allegedly related species such as chimps and humans. Right now we don’t have that. Real scientists Dr. Michael Denton tells us that DNA does not determine the final form of what develops. Real scientist, geneticist Giuseppe Sermonti agrees. Survival of the fittest- the fittest clown fish is still a clown fish- doesn’t seem to help with the issue of producing different body plans. So we will see what I said that is allegedly false. Swamidass states the Bayes factor difference between the tree and dependency graph is a small percentage of the tree’s Bayes factor. So, this means it could easily be attributed to missing data or the atypical evolutionary operations of gene transfer or convergence. I’m not sure how correct he is. 1.7% is a small percentage, but it is unclear what that translates to in difference between trees and graphs. A small percentage of a very large graph is still a very large number. A more useful metric would be graph edit distance, and some kind of empirical data whether that edit distance can be accounted for by known non-intelligent evolutionary operations. Yep, yet both sources are deemed credible though by Darwinist and others in the case of BioLogos. And Swamidass was part of BioLogos in the past, thus my reason for posting it. But I realize like the ID community they can have different opinions on subjects. So, this means it could easily be attributed to missing data or the atypical evolutionary operations of gene transfer or convergence. “Convergence” = the magic pixie dust of Darwinist imho. I’m with ET @40 in that “we don’t know” yet. Now, if by Design and Common Descent, there should still be a mechanism at play to show how life unfolded and are “convergent” as this should be discoverable as reverse engineering of life continues. While complex, if by Design and not by blind events, engineers and scientist should eventually be able to discover mechanisms of convergent technology. As “convergence” tends to pop up all over the place. Naturally Design and not blind chance is more amenable to this reality of what we see as Common Design. Swamidass has passed this off before. I’m not against Convergence as a form of factually what we see in the fossil record or in molecular mechanisms. Only against it as a blind, unguided series of events. And I think as the Epigenome grows in function, it will confirm and make harder any appeal to blind, unguided mutations contributing to “convergent” evolution. Edit: one of two outcomes? Simply appealing to “convergence did it” by a blind series of events is not a robust answer. Yep – “still a vary large number.” And your point about distance is interesting as well. Looking at it from another way besides pure information and statistics. Many discoveries recently in molecular biology, DNA, and Epigenetics, are overwhelming blind evolution. The communication and location systems involved within molecular systems allowing for different domain retrieval and editing of DNA, Splicing and post-translation modifications swamps the appeal to “non-intelligent evolutionary operations” as you state. I see. This is why in Dr. Swamidass’ thread I stated the evidence he provides seems to best support the dependency graph model, and he may be equivocating between common descent by birth and common descent of genetic material. If a unborn baby has a portion of its genome genetically engineered while in the womb, then it will be a descendant of its parents by birth, but not genetically. The big problem for me is the discussion is not boiled down to easy to understand terms, but makes use of technical language. When I look into the meaning of the words it isn’t clear to me why the concepts are considered to be evidence for evolutionary common descent. So, to use the terms to dismiss Dr. Ewert’s result is confusing to me. At any rate, my take away is that Dr. Ewert is correct and Dr. Swamidass agrees with him: a tree model is a bad model of what’s happening in biological history. There is some kind of dependency injection going on. Whether that is de novo creation of many individual kinds using a genetic library, or directed evolution, or unrelated segments accidentally deposited by viruses, or some combination, or something else, external dependencies are entering the genetic code somehow. Therefore, genetic common descent is dead. If I’m misunderstanding somehow, let me know. Actually, Dr. Swamidass is attempting to sweep the impact away with some math equivocation. He divides the D. Graph v Tree log Bayes factor by the Tree v Null factor to claim the D. Graph is only 1.7% better than a Tree. However, the log Bayes factor means the D. Graph is 2^111,823 times better than a tree. Big difference. The nonsensical answer to my question was “Evo devo- using the same genes differently”. This has been the rallying cry for those advocating Common Decent for at least a coupe decades and nothing has come of it. But this is their view and they will not have it challenged. I had my account suspended for the weekend for scoffing at the notion that evo-devo offered a testable mechanism for Common Descent and offering Drs Denton and Sermonti for my support. Given that a clade is, by definition, monophyletic, common descent most certainly does predict “perfectly nested” clades. The data does not match the prediction. So what do we do? We ignore the data, or say it doesn’t matter, or add epicycles to the theory.